Single and Multiple output battery chargers for use with the AC005 Portable Battery pack. The chargers provide a completely automatic charging system where an initial boost charge, as indicated by the red boost LED, is provided until at least 90% of the battery’s capacity has been restored, then the output is automatically switched to trickle charging with the green LED flickering before becoming steady indicating a fully charged battery. The battery may be left connected indefinitely without causing any damage. 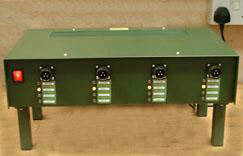 For multiple charging of AC005 battery packs simultaneously the B225-4 can be supplied fitted to racks.